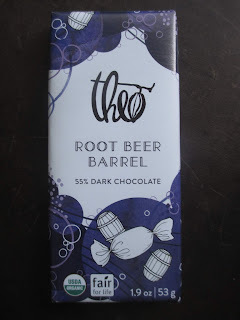 Theo's Root Beer Barrel bar is the second of their no-longer-new chocolates that I've been wanting to try for quite a while now. My head skipped over the "barrel" part and was just thinking of root beer the soda, but it turns out that Theo was going for root beer barrel candy rather than the soda. Being of the younger generation, that candy wasn't the first thing to come to mind, though I definitely do remember them. Hmm. Even though they're more of a nostalgia candy and I do tend to love the nostalgia candy, I don't think I usually see them for sale with other such candy. I can't think of seeing them for sale anywhere in particular; I just know that I do remember eating them. The idea of root beer barrel chocolate, in any case, is definitely what I would call a unique concept. By the time this chocolate bar came to be unwrapped by me, it wasn't looking too pretty anymore, so I would almost rather skip photographing it at all. However, I did desire to capture this little gem peeking out; it's the candy element that I hadn't been expecting when I at first thought of simply root beer soda. But if you're going for root beer barrel candy, then a crunchy candy element makes sense. Along with the Theo dark chocolate aroma (this is their 55% cocoa), this bar does have a distinct root beer scent to it. Though I'm not at all a soda person (surprise, surprise, eh? ), root beer is the one I have more affection for (along with cream soda). It has that old-fashioned flavor and feel that takes you back to the young days of soda, the days in which you went out to the soda fountain to get a drink instead of buying it by the liter at the grocery store. You'll want to crunch slightly into this chocolate to get into the flavor. Then you'll start getting that root beer taste along with the sugared candy flavor, all kind of enveloped in the chocolate. It's unique without feeling weird. That spritzy root beer taste springing around rather amazes me: it tastes just right. And the sugary bit is in the perfect balance, just enough to give that reminder of candy. The chocolate, as well, comes in with the correct proportion. It's dark enough to hold its own and keep the piece from being candy while also not so dark as to lose that sense of whimsy. I definitely recommend this one. It's what nostalgia chocolate or novelty chocolate should be. It's what casual chocolate should be. It's what flavor experiments should be. It's a lot of fun and it tastes good and it's good quality. It's exactly the type of product that Theo continues to deliver so well.